The Nauticam Wide Angle Corrector Port (abbreviated to WACP from here on) is one of the hottest new launches in the underwater photography market. Why? Well, the main reason is that as a combination lens plus port with specialised underwater optics, it promises the gold standard in image quality. More specifically, it is sharper, especially at wider apertures, than just about anything else out there. The Nauticam Wide Angle Corrector Port (WACP) fitted to my housing. It functions as both a port and a lens, optimising the optics for use underwater and expanding the field of view. Back in the old days of film, the hottest underwater cameras to have were the Nikonos range. Unlike today, where most serious shooters will get a camera and then buy a housing separately, these were cameras and lenses with which you could take straight underwater - no need to buy a housing separately, they were ready to go. Nikon spent a long time developing lenses specifically for use underwater to accompany the Nikonos cameras. Yes that’s right, one of the top camera brands in the world poured money and time into researching lenses with optics that would function optimally underwater. Unfortunately, in 2001, Nikon officially ceased production of the Nikonos range. These days, you may well use a Nikon camera underwater, but it will be encased in a housing from a different manufacturer. Likewise, you may very well use Nikon lenses underwater, but they are lenses designed for land use, over which you then need to add some sort of port to bring them on a dive. In fact, those old, purpose-built Nikonos lenses are back in fashion and highly sought after. 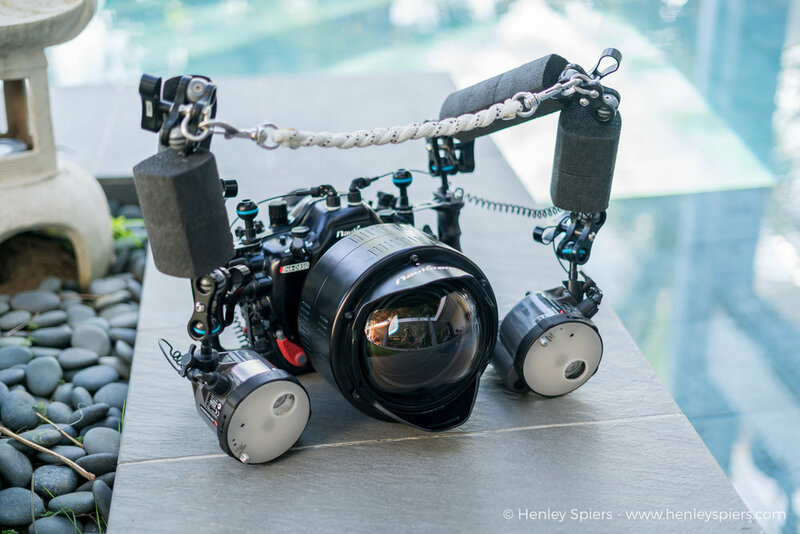 Top-end professionals, like the crew who filmed Blue Planet 2, use that old Nikonos glass because it delivers super sharp images all the way into the corners, even in dark conditions and at fairly open apertures. You see, nothing works quite the same underwater as it does on land. You can buy the most expensive, elite lens on the market and bring it underwater to find that it becomes a rather average performer. Lenses which might be sneered at by elitist land photographers are treasured by their underwater counterparts. For a start, fish-eye lenses are the go-to weapon for wide-angle photography but rarely used in topside photography. Indeed, the Tokina 10-17mm is a £500 fish-eye lens which has achieved mythical status for its performance in underwater photography. That has been the status-quo for a while now, but Nauticam has started to shake it up with the introduction of first their Wet Wide Lens 1 (WWL-1), and now the WACP. Why has no one been doing it before now? Well, producing a high quality lens optimised for in-water use is both very complicated and very expensive. The WACP, whilst not providing as ultra wide a view as a fish-eye set-up, is still capable of capturing big scenes. It arrived in a fancy cushioned bag, perfect for travelling (Nauticam seem to be doing this with all of their bigger products now, including housings, which is a nice perk). The first thing to note is that this is a hefty bit of kit. At 3kg, that’s already somewhere between 10 to 15% of your standard airline-allocated luggage allowance out the window. It is heavier than a regular dome port and, on land, it one part impressive and one part pain in the arse. Usually I take sadistic pleasure in the ‘free exercise’ that carrying your underwater rig on land provides, but when it comes to the WACP, even I wasn’t having much fun. The best way is to get the lanyard set-up so you can sling it over your shoulder, man-bag style, and even then, it’s irritatingly uncomfortable, with the weight of the lanyard digging into your shoulder whilst your viewfinder pokes you in the kidneys. Oh well, at least on-lookers marvelled at my ‘massive’ rig. Cumbersome on land but a pleasure underwater. Once in the water however, the WACP becomes magically easy to manipulate. Equipped with a double set of arms with full floats on either side, the set-up was now very slightly negative and a pleasure to dive with. Unlike your air filled dome ports which want to float head-up, the WACP has a lot of weight in the front so it wants to lay down. This results in a moderate change to how you tend to angle your wrists but no big deal. For a minute I thought I would go through the painstaking process of settling down with a composition and shooting it at various apertures to compare corner sharpness. Then several months of baby-induced dive deprivation kicked in and I decided to pass these treasured immersions in pursuit of funner projects. Wetpixel, Alex Mustard and Jason Isley have thankfully done the homework for us and their results can be found in this excellent review. The headline is that Alex deems the corners to be acceptably sharp all the way down to f5.6. Now I was operating in bright, shallow reef conditions so didn’t have any need to push things that much, but it’s certainly nice to know you have it if necessary. As for the overall sharpness of the lens, well, I was blown away when zooming into the detail on this table coral shot *wipes saliva from chin*. Check out the awesome detail on the table coral from the image above! Zoom, zoom, zoom, zoom…I want you in my room. At 28mm and capturing a wide angle Batfish scene. Zoomed in to 70mm for a Longfin Batfish portrait. Traditional close focus wide angle is also within the WACP's remit. The WACP is so new to the market that they are still adding to the list of compatible lenses and there will surely be a lot more experimentation in the future. For now, I followed Alex Mustard’s ingenious strategy of pairing it with a Nikon 28-70mm f3.5-f4.5 (note: this lens is no longer in production and, if the WACP takes off, will surely be in short supply - I’d suggest getting in early). This gives you the widest zoom coverage of any DSLR set-up that I know. As a photo-journalist, this is a very enticing prospect as, when covering a destination in a short space of time, without knowing what you will encounter, you have a lot of flexibility. Indeed, I remember being in Tubbataha and finding my fish-eye lens to be too wide for a lot of the potential shots. It’s a pristinely protected location but the marine life is wary and rarely comes super close to divers. The dives I had there were beautiful but often frustrating from a photographic perspective, with a lot of subjects staying just out of frame-filling range. I now wish I’d had the WACP with a 28-70mm, as this would have allowed me to capture big scenes but also zoom in for the more skittish subjects. Working with this set-up in Cebu, I was able to capture very big scenes in natural light, close focus wide angle shots and relatively close-up fish portraits. I was mainly shooting with the lens at 28mm or slightly zoomed in and feel there is still room to push it’s close-up capabilities. Sure, there were a couple of moments when I wished it was even wider, but these were rare. Having gone from choosing between macro or a super wide angle set-up before every dive, the WACP combined with the 28-70mm lens fills you with confidence that you can tackle almost any subject encountered. It also opens up the creative opportunity of zoom burst shots, something I hadn’t tried much before but really enjoyed. Hell, you could go all crazy and start combining a zoom burst with a camera spin if you like - check out this shot by Tony Cherbas for inspiration. Zoomed in slightly to 35mm, allowing me to optimise the frame for these Midnight Snapper. One area in which I did put the WACP through a thorough workout was it’s ability to deal with shooting into the sun. I found that it did a good job with some small flare appearing on occasion, particularly when shooting in 5 metres or less. This could usually be easily corrected in post-processing and isn’t bad enough to put me off using the WACP in those conditions, but it is worth being aware of. A tiny bit of flare appears beneath the diver in this shot. Again, a little bit of flare at the bottom of the image, but no big deal. I spend a fair amount of time shooting people and the WACP provides exciting opportunities in this respect. Being a rectilinear lens, it promises to be more flattering than fish-eyes. I had a chance to give it a try out with Jade in the sea and Apolline in the pool and am happy with the results. Take a look and see what you think. The WACP - makes people look better than fish-eye lenses! My first impression is that the WACP is a very impressive bit of kit indeed and in combination with the 28-70mm is likely to become my go-to set-up for wide-angle underwater photography. Sure there are some shots it’s not good for, split level images for instance, but it opens up the possibility of more subjects and scenes than any other DSLR set-up that I know of. I’ll be back in the water soon and am looking forward to continuing to put the WACP through its paces.